Interesting results. Don’t know if im too keen on messing with that type of pressure, that close to my face though. I wonder how it compares to an actual slug? Any of you guys ever done this? Interesting concept. I dont think it was smart of the younger fella to mention any kind of “cook book” with relations to firearms as the “cook book” series have quite the collection of red flags associated with them. Agreed. The cook book comment took what was supposed to be a simple historical/educational video into something completely different that could be labeled as ‘destructive’. otherwise, its a pretty cool trick, I know people who have done this and they swear by it. Seen a video on Travis Haley doing this awhile back. I knew it was an old technique, but it is still interesting to know. I have not, but it was on the Magpull video at the end. I would imagine you’d run into problems feeding them through a pump or semi. Would warrant some testing to find out though. I just might do it sometime with some cheap trap loads. nah, when the bolt engages, it rips the hull… not that i tried it after watching this video. but if i did, i’d hold ENDO and Mike harmless. This is actually a two part video; he makes some other custom shotshells and states that if you dont like cutshells or want them to cycle, superglue is the way to go. Basically you either superglue all the shot together or to get them to cycle in a semi, just make the cutshell then glue it back together; it should come apart when you fire. However, I’d really hesitate to fire a cutshell in a semi, might blow up like a high pressure bolt gun round in a semi rifle would. And that’s awesome. Probably illegal, but awesome. Someone should do some penetration tests with it, because if that goes in at all, you’re going to have a fist sized hole in you ._. I use them for plinking, cheaper than slugs or buckshot and about as fun. As far as accuracy goes they’re about the same as a rifled slug, but they move slower so you need a good holdover if you’re trying to hit something a ways off. As far as cycling goes, it depends. I’ve found if you cut them the right, leaving three small ‘tabs’ of hull left (made a video to show some forum buddies http://youtu.be/9T-PyT423WM) like so, they’ll cycle through a pump if you do it gingerly. Haven’t tried them in an auto, but I imagine the violence of the action would break them. When they hit a soft target, it’s really something. I know they’d penetrate less than a slug into something really sturdy, but they rip them selves apart and dump all the energy in almost immediately after they penetrate; just about blow the back 3/4 out of a pumpkin. I’ve done it back in my younger and dumber years. It worked. No problems. After seeing this video, some friends and I tried this the other day. It worked pretty well out of my single shot, and leaves one heck of an exit hole. In my teenage years in the 70’s my buddies and I ran around in the desert outside Tucson with single barreled shotguns and these a lot, they tore the hell out of cactus and jackrabbits. Of course we also (don’t try this at home) cut the shot column out of shells and had wad wars ( I know how stupid it was) , we even had a war at a guys house in a neighborhood. The people next door called the cops, one unit rolled up and saw 8 guys running around the house shooting shotguns at each other, he got out of his car and yelled at us to quit, told our dumb asses to put up the guns and how stupid we were, then left. ( we quit doing it after that encounter) Those were the days, now it would be a SWAT team, a M113 and air support before they would come down the road,. LOL that’s one of the crazier childhood stories I’ve heard in a while. Yea now that would be live on international news, and like you said there’d be helicopters etc..
Just an airstrike… no ninja casualties. The wads did hurt, but it taught me to not leave anything sticking out to be hit! Jackrabbits bred like…..Jackrabbits, we got a bounty on all killed, they tended to dig and the cows would break ankles, they also played hell on any crops so the farmers were happy to see us. 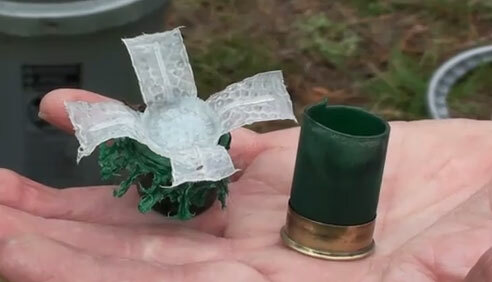 The Irish used these cartridges pretty effectively against the British Army in the 1920’s. When your only firearm is a shotgun, you can get pretty creative. The interesting question is the one about pressure. Does this affect the chamber pressure? Also, since it’s sending a larger diameter object down the barrel, would it be better to only do this in a cylinder bore gun? nah I think ill pass… my 3inch mag slugs will work better plus I dont have to sit there and cut on em. Neat concept tho. No need for anything more and I like my shoulder. I’ve done this with light shot but just did a mid-depth scoring around the shell. I set up a jig on my workbench and got fairly precise with it. Used them in my pump with no problems, but yeah, not so sure about an auto. One of my VN vet friends said they used the paper hulled shells and the scoring method- the paper was bit more forgiving. I wonder about longevity of paper hulls in such a damp environment, though. Like said above, the penetration is minimal but the energy dump is maximum. No issues with chamber pressure- it’s the same powder load pushing the same amount of shot. I showed this to a friend who said it was an old poacher’s trick from Pennsylvania. Poachers would use these to hunt deer during small game season, and all they’d have on them would be birdshot, should a warden stop them. A guy at a forum I frequent did some testing on these and found that they do indeed increase chamber pressure, so as a next step he tried cutting open the shot shell and taping the shotcup, takes about 3 layers of standard packaging tape, it’s a bit more work, but it leaves the hull intact and reduces the chance of something bad happening. If you watch the end of Magpul Dynamic’s “Art of the Dynamic Shotgun,” Chris Costa shows how to do this. He said its only good in a pinch and don’t load it in the tube. so what do it do in a taurus judge? ?